(MENAFN - Daily News Egypt) Algeria's Constitutional Council approved, on Wednesday, the vacancy of the post of the president in accordance with article 102 of the Constitution. Thousands of Algerians celebrated in the streets following the announcement of the Algerian President Abdelaziz Bouteflika's resignation on Tuesday night, after the call of the Algerian army's Chief of Staff, Ahmed Gaid Salah's demand. The resignation came about an hour after Saleh's call for the immediate implementation of articles 7, 8 and 102 in the Constitution, including the article about the vacancy of the president's post. Saleh's statement also criticised what he called the ruling oligarchy on the 'formation of enormous wealth by illegal means and in a short time, using its proximity to some of the suspicious decision makers." Following Bouteflika's resignation, the French Foreign Minister, Jean-Yves Le Drian, expressed confidence that Algerians can continue the democratic transition in the same spirit of calm and responsibility. "The Algerian people have shown in recent weeks, through continuous, dignified and peaceful mobilisation, that they are determined to make their voices heard," Le Drian said in a statement. The protesters condemned Bouteflika's bid for fifth term chanting pro-democracy and saying 'no fifth mandate' 'no Bouteflika' while waving the Algerian flag. 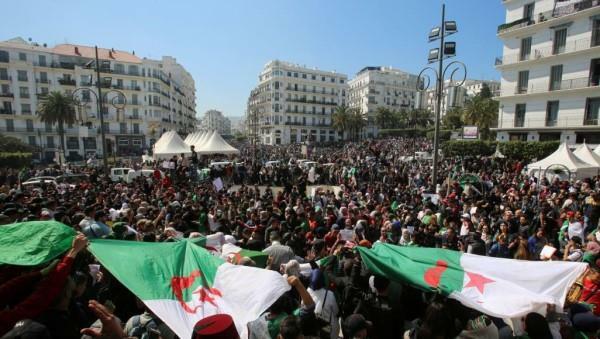 The Algerian uprising has no leaders so far and the opposition did not agree on one stance or candidate.